Honey dyed by M&Ms: Why do beekeepers have to throw it out? Why Do French Beekeepers Have To Throw Out Honey Accidentally Dyed Blue and Green by M&Ms? This summer, bees from several apiaries in Eastern France were making blue and green honey. The culprit? M&Ms. But Parisians won’t be drizzling blue honey over their croissants anytime soon. The dyed honey is considered unfit for human consumption, or “unsellable,” as one disgruntled beekeeper put it. With the bee population in rapid decline around the world and France being the No. 1 producer of honey, this was bad news for local beekeepers already struggling to keep up with the demand. Brooklyn beekeepers were equally affronted last year when their honeycombs were turned bright red after bees guzzled up maraschino cherry juice from a factory nearby. But why is dyed honey such an offense to the profession? Unlike a diamond, you can’t tell whether a honey is good or bad just by looking at the color. But the shade can give you lots of information about the bees that produced the sweet stuff—from what type of flowers the bees fed on to the temperature at which it was stored. The USDA puts honey into seven different color categories, ranging from water white to dark amber, which is helpful because the color is also indicative of its flavor, with darker honeys having a bolder, more robust taste. But without chemical influence—say, from the Blue 1 and Green 3 dyes found in M&Ms—it won’t take on the brighter colors of the rainbow. Verhoek says that the only time a beekeeper will purposely change the color of honey is when infusing honey with dried fruit powder, or when making flavored creamed honey or honey sticks. There are currently USDA guidelines—but no mandatory standards—for what you add or don’t add to honey. George Hansen, president of the American Beekeeping Federation, says USDA’s lack of mandatory standards for honey is a pain point for the industry, which has to deal with adulterated product. The fact that the bees are resorting to artificial sources of sugar at all is worrisome. 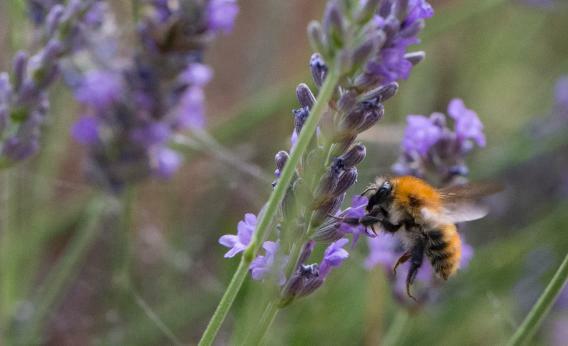 “When bees go to non-floral sources, it is a sign that the environment is short of resources, ” says Toni Burnham, vice president of the Maryland State Beekeepers Association and a columnist for Urban Beekeeping. Occasionally, a hive will die when bees bring something home that seems sweet but is actually toxic, like improperly stored antifreeze. “Bees are just the messengers here,” says Burnham.